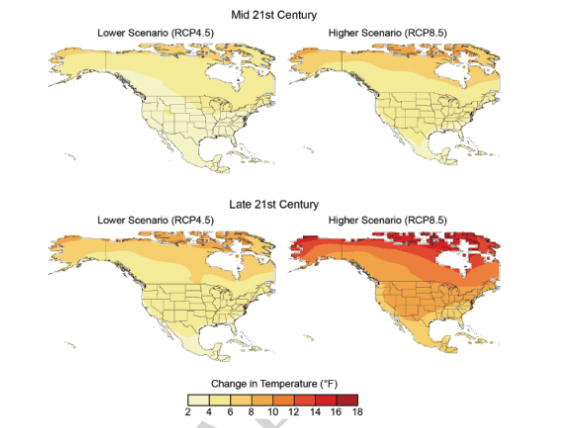 -Average temperatures in the Lower 48 states increased 1.2 degrees F from 1986 to 2016, and are projected with very high confidence to rise faster in coming decades. -The report increases the worst-case projection for global sea-level rise by 2100 to 8.5 feet, up from 6.6 feet in the last report. -With rising sea level, tidal floods in some coastal cities have increased 5- to 10-fold since the 1960s, and continue to rise. The rate of increased flooding along the East Coast is accelerating.